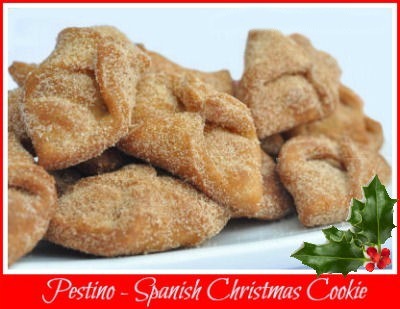 Pestiños are flaky and delicate Spanish cookies from Andalucía, in southern Spain. They are normally served at Christmas but can be made any time. I love making cookies this time of the year for cookie swaps. Another great Christmas cookie recipe is the one for lemon snowball cookies. They bring out the holiday spirit just like these Spanish pestiños cookies do. Pestiños are very easy to make and the ingredients are probably already in your pantry – simply flour, anise seeds or flavoring, white wine and oil. Roll, cut and fry. Once they are fried, you can dip them in warm honeyand enjoy! Why not try to add a bit of Spanish flavor to your Christmas holiday menu selection with some of these Pestiños? These delightful Spanish cookies are flavored with anise and wine for a subtle flavor. In a small bowl combine the Riesling, sea salt, lemon zest and orange zest with the olive oil and the anise seeds. Stir in the flour and cinnamon and knead until you get a smooth dough. Roll dough to a 1/8 inch thickness on a lightly floured silicone baking sheet. Using a knife, cut the dough into 2 x 2 inch squares. To make the pestinos, take two opposite corners from each square and press them together in the center. You can make them stick with a small amount of water. Heat the coconut oil until the temperature is 375°F. Carefully drop the formed pestiños into the hot oil and allow them to float to the surface. When they are golden brown flip them over. Remove from oil and place on paper towels and toss in cinnamon sugar. Recipe adapted slightly from one on Imperial sugar. Thanks Helena. glad you are enjoying the site. i was just curious… does the coconut oil used for this come in the form of a solid, which is then melted and brought to the temperature, or should it come in the form of a liquid?